Framed paintings and photographs add a splash of color to a room and give it a unique personal touch, but some homeowners are reluctant to tackle the job for fear their walls will end up resembling aged Swiss cheese. With the right hardware and know-how, you can approach your next picture hanging project with confidence and safety. The center of the picture should be at eye level, approximately 60” from the floor. Leave at least a 3” to 6” gap between the top of a sofa and the bottom of the picture frame, and 4” to 8” inches from a table top. Treat a grouping of pictures as a single unit. Center the picture or grouping within the available wall space or over the piece of furniture below it. Position pictures away from direct light and high humidity. Deciding on a location for one picture is fairly simple, but arranging several pieces in a single space can get a bit more complex. The answer is to make paper templates with arrows on them to indicate whether the piece will be hung vertically or horizontally. Tape the templates to the wall, using easy-release painter’s tape, and rearrange them until the grouping is to your liking. Once you’ve decided on the perfect spot, use a stud finder to identify wall studs and mark their location with Post-it Notes or painter’s tape. While holding the picture in place, put a strip of painter’s tape on the wall with the bottom edge even with the top of the frame. Mark each end of the frame on the tape then remove the picture. If the picture will have only one wall hanger, find the width of the frame, divide by two, and measure this distance in from the marks on the painter’s tape. Split any difference between the two marks for the center. For added stability on wide frames, use two hangers that are equidistant from the center point. If the frame has a hanger on each side, measure in from the outside edge of the frame to the center of each hanger and transfer these measurements to the tape. Before hanging check to make sure the hangers are well secured into the frame. If adding or moving hangers remember that mirrors or picture cover glass extend back 3/8" or more from the inside edge of the frame, so do not drill or screw in this area. Next, turn the picture over and measure from the top of the frame to the point the picture will hang. For pictures with a hanging wire and one hanging point, hook the metal end of a tape measure under the center of the wire. Pull up until the wire is taut, and measure up to the top of the frame. For frames with a wire that will have two hanging points, pull up on the wire at both points simultaneously then measure up to the top of the frame. For pictures with D-rings or saw-tooth hangers, hook the tape over the top of the frame and measure down to the spot where the wall hanger will be attached. Transfer the hanger location on the wall by measuring down from the bottom edge of the painter’s tape. Then use a level to make sure it is plumb with the mark on the strip of tape. The approximate weight of the picture. The type of hanging hardware on the frame. If the wall hanger will be attached to a stud. There are a number of hardware options for hanging pictures, with the label on the package usually giving the maximum weight each one is designed to hold. To find the weight of the picture, weigh yourself on a bathroom scale while holding the picture then subtract your weight from it. Traditional metal picture hooks work well for lightweight frames fitted with wire while screws or nails are a better choice for sawtooth and D-rings hangers. If the hanging hardware will attach to a wall stud or solid wood paneling, just about any hanger suitable for the frame and rated for the weight of the picture will do. If the picture is heavy and a stud isn’t present, you’ll need to use a wall anchor on drywall or plaster walls. Self-tapping threaded anchors are suitable for attaching all but the heaviest pictures to drywall. Anchors that spread out behind the wall—such as toggle or molly bolts—provide the most holding power and help keep plaster from cracking. The latest innovation in picture hanging hardware is a thin curved spring steel wire sold under brand names such as Heavy Duty Wall Hanger, Hercules Hook, and Monkey Hook. To use, simply twist the sharpened point through the drywall and push the wire into the wall cavity until it locks in place. Wire hangers will only work where there’s not a stud or other obstruction in the wall. They are quick to install and remove, leaving a very small hole that is easy to spackle and paint over. Keep in mind that the spot marked on the wall and the location you attach the hanger may differ since the hook often extends down from the nail or screw that holds it. 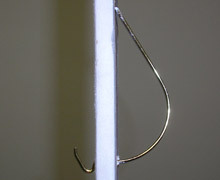 To make sure you get it right, position the lowest point of the hook at the mark before attaching the hardware to the wall. While you can nail or screw directly into drywall, always drill a pilot hole first in plaster to prevent cracking. Brick and concrete walls require drilling a hole with a special masonry bit then either hammering in a masonry nail or using a plastic anchor and screw. To prevent your picture from marring the wall and keep it hanging level, apply self-adhesive soft plastic or rubber bumpers to the bottom corners on the back of the frame before hanging. After suspending the picture on the hanger, remove the strip of tape, and use a level to check your work. Before finishing, make sure the piece is securely attached to the wall.